“We are sensitive and responsive to the needs of the communities where we live and do business.” Since the beginning we have had a strong sense of our values. They have been our compass and will continue to guide us into the future. Everything we do revolves around our shared values. We abide by our Best Practices in all we do. It is who we are as a group, company and as the BFW Family. We invite you to join us in supporting the mission of the Vision Resource Center on Thursday, September 27 at the Crowne Plaza. Although many in our community are affected by vision impairment, it is still an unfamiliar challenge for many. We were not personally or directly affected by the challenges of vision impairment, however many years ago a friend of a friend reached out to Ted and asked him to contribute his expertise to the Building and Grounds Committee. Soon after Ted began assisting he became compelled and committed to the mission. What was so compelling? The drive and dedication of the staff, volunteers and leadership making such a positive impact with such limited resources. The organization gives skills, engagement and so much more to those with vision impairment. It is clear that they believe those they serve deserve a full and happy life with no boundaries. Last year we had the privilege to attend this fundraising dinner. We had fun with old friends and new. We experienced vision impairment while enjoying an amazing meal utilizing an entirely different sensory experience than ever before. We were coached and encouraged by an astounding young woman who lost her sight at a young age and was studying to teach those with visual impairment. We laughed as the idea of putting our salad dressing on with no vision seemed daunting to us. We celebrated the success of the organization and those who have overcome the obstacles of vision impairment that have been presented to them with the support of the Vision Resource Center. 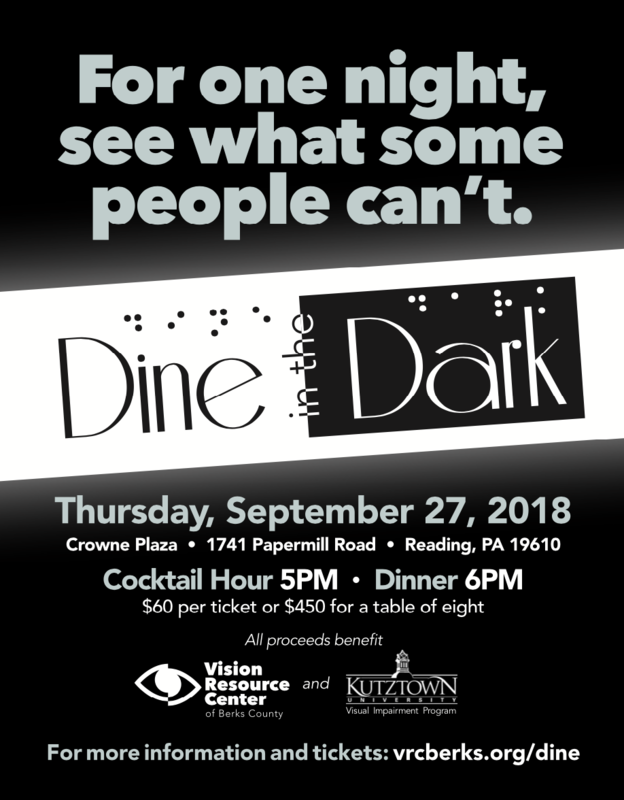 This year we are proud and honored to Co-Chair “Dine in the Dark.” We ask that you join us in supporting, experiencing and celebrating the work of the Vision Resource Center and the achievements of those living with vision impairments.